From Rorate Caeli, this post is about Bishop Richard Williamson performing Confirmation for SSPX-friendly communities in Brazil, without the instructions or permission of the Superior General, Bishop Fellay. Bishop Fellay said recently, in many public conferences in Australia, that nothing new would happen for the SSPX under the present pope. And if we consider the appointment last June of the German Archbishop Müller at the head of the Congregation for the Doctrine of the Faith – he considers Vatican II as infallible – the present situation is going to continue as it is for many more years. I do not attend an SSPX chapel, but I was still worried about the infighting within the SSPX between the different factions (kind of like the wider Church). But for Bishop Fellay to state that a resolution between Rome and the SSPX will not happen under the current pope is very interesting, and a bit depressing. What exactly happened in that June 13 meeting? The videos from Rome’s side (the Cardinal Burke video, the CNS reports) and the SSPX side (including the interview with the United States District Superior) were all positive, and preparing for a reception of the SSPX into a canonical structure. 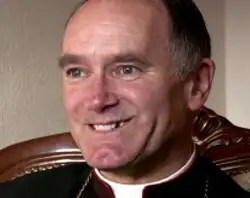 Then the June 13 meeting occurred, something new was handed to Bishop Fellay, something he did not expect, and he felt he had to walk away. Catholic Laymen don’t know exactly what has been discussed in the doctrinal discussions of the last few years. And we don’t know what was in the Doctrinal Preamble. Something new was required of the SSPX, and everything blew up. If anyone from the SSPX, or anyone else for that matter, knows of non-confidential details (this blog keeps private letters just that, private) please feel free to leave a comment. I am aware of the doctrinal problems (and have a lot of sympathy for the problems with some Vatican II documents). But I just wish to know, what happened?? I have neglected prayers for this situation, that God will be done (there are so many things to pray for). I will try to offer more prayers for all involved. This entry was posted in SSPX and tagged Bernard Fellay, Bishop Fellay, Bishop Williamson, Richard Williamson, SSPX. Bookmark the permalink.